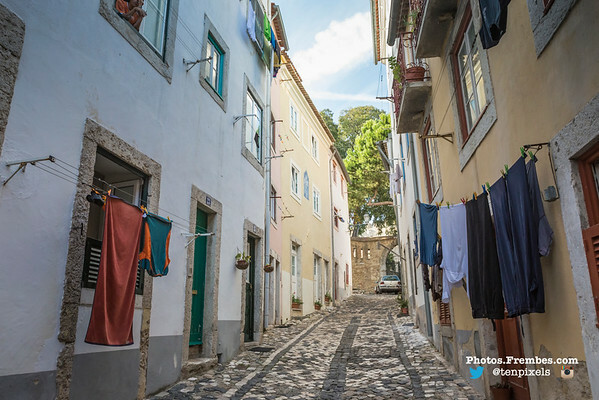 There are so many great neighborhoods to explore in Lisbon. And, as I cover in my first post, so many great places to eat along the way. The guidebooks all offer walking tour itineraries that are pretty spot-on. These are a few of the places that we either liked, or that were places that offered great photography opportunities. Nearby, the Centro de Arte Moderna is a modern art museum that is part of the same complex as the Museu Calouste Gulbenkian. 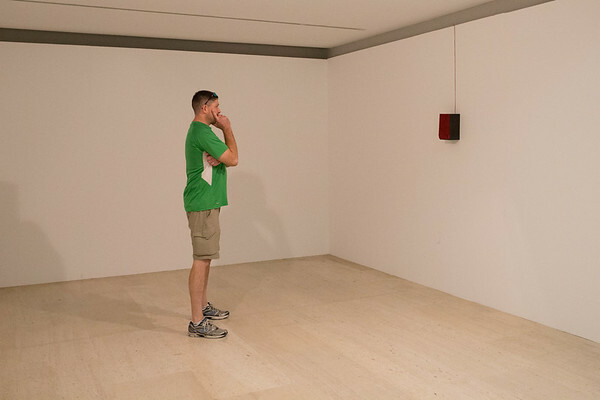 I found the art there derivative as compared to some of the better modern art museums in the US. For example, there was a spare, blank space with a single loudspeaker that repeated the same scratchy recording over and over again. Make this a stop if you’re curious, but don’t make a special trip. After a night of rest, we headed out early for our first full day of exploring Lisbon. We took the metro to Praça do Comércio (Commerce Square), an open square that serves as a transportation hubs for trams, buses, and taxis. It’s fun to hang out here and people-watch. 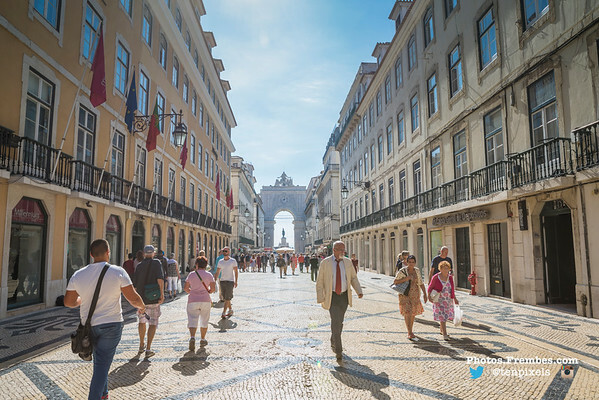 If you stay in Lisbon, you’ll find yourself at this square a lot – either picking up the tram, eating at one of the restaurants that line the square, or just hanging out and watching the street performers. The Rua Augusta Arch is one of the major features of Commerce Square. You will see it from blocks away as you approach the Square on foot from Rue Augusta. Nearby Commerce Square is MUDE, or the Museu do Design e da Moda, a free modern design. They offer rotating design-related exhibits. When we visited, there was a furniture and fashion design through the decades as a temporary exhibit. Please note that photography is not allowed in most of this museum. 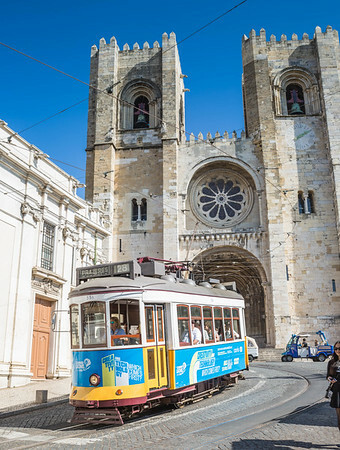 We stopped at Sé De Lisboa (Lisbon Cathedral) on the way – convenient since there is a tram stop right across the street. I love old churches and it was so worth it to pay the extra money to see the cloisters and the excavation. 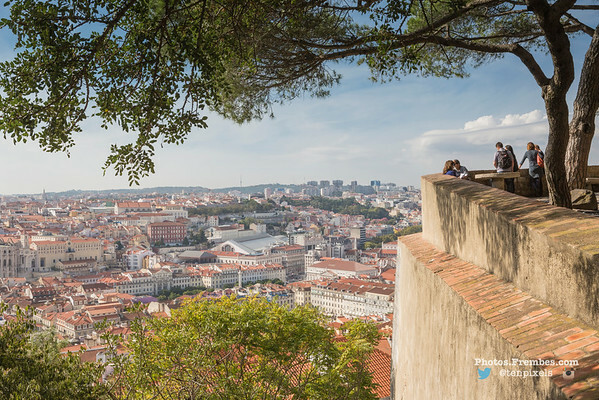 We hopped back on Tram 28 and headed up to Castelo de São Jorge (St. George’s Castle). The views here are incredible, but I have to be honest: I am not a huge fan of empty castles. If you love castles, then come here. Otherwise, I was enjoying the great views of Lisbon down below. After a few hours at the castle, it was time to head downhill on foot with a stroll through Alfama, a very photogenic neighborhood. This walk was one of my favorite moments of the trip. We didn’t really follow a particular walk in the guidebook. There was enough to see/catch our interest that we wandered – always pointed downhill so that we were headed in the correct general direction. Our third day on the ground in Lisbon was spent visiting very targeted sites. Rain was forecast for the next day so we were under the gun to explore another neighborhood (Baixa) and visit sites that were outside. Our first stop was Igreja de São Domingos, a beautiful church that has survived fires and the famous earthquake. Spend some time wandering around inside and seeing how the damage is still evident many hundreds of years later. Next, we walked over to the Elevador de Santa Justa (Santa Justa Elevator). I know it’s weird to recommend taking an elevator, but there are two reasons to take it: (1) The views from the platform are amazing, and (2) it saves you a walk uphill to Carmo Convent. You’ll pay the standard metro fare for the elevator ride if you use the Viva Viagem cards. We didn’t pay the extra euros to go up the spiral stairs and get a super elevated view though. 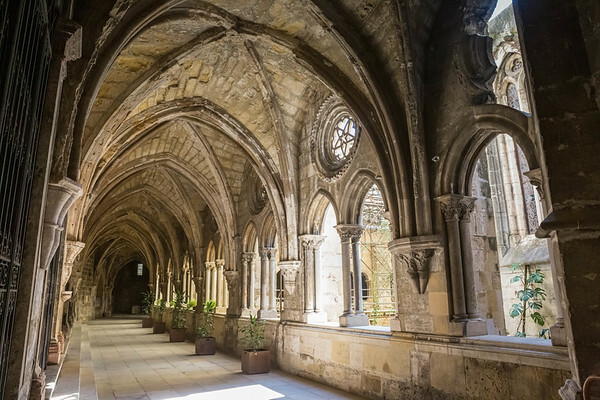 Museu Arqueológico do Carmo (Carmo Convent) is a short walk from the Santa Justa Elevator. It is nothing short of magnificent. €3.50 each to get in and worth every penny. 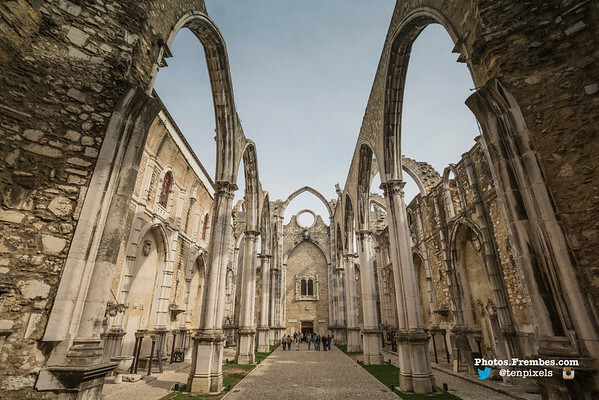 The structure was damaged in the 1755 earthquake and the rebuilding effort was abandoned a few decades later. The nave has remained open to the elements ever since. It’s just an incredible thing to see. We rounded out the day with a stop at Museu e Igreja de São Roque, a beautiful church from the late 1500s that was the earliest Jesuit church in the Portuguese world and one of the first Jesuit churches anywhere (thanks, Google!). The chapels within the church are all ornately decorated, some with gold leaf and other precious materials. Our fourth day in Lisbon was a super rainy and windy day, so we spent the day at the Oceanário de Lisboa (Lisbon Aquarium). This is worth the stop if you have a day that the weather doesn’t cooperate. Otherwise, it’s not something we would have chosen to do. The next day was still cloudy and slightly rainy, but I was determined to make it to Belem on the outskirts of Lisbon. 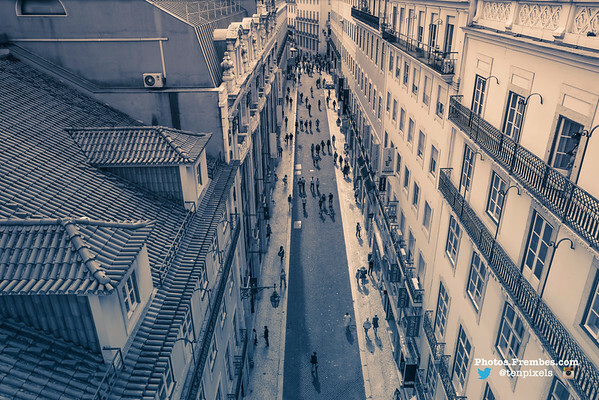 We took the Metro to Baixa-Chiado, walked to Commerce Square, and picked up the 15E tram for a 45-minute ride west. Upon arrival, we tried the Mosteiro dos Jerónimos (Jerónimos Monastery) but the line to get in was way too long. Instead, we headed across the street to what is my favorite monument on the entire trip, the Padrão dos Descobrimentos (Monument to the Discoveries). 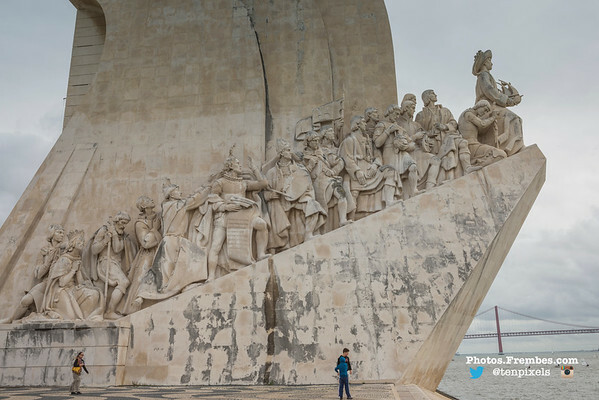 The massive monument celebrates Portugal’s Age of Discovery during the 15th and 16th centuries. This is an absolute must-see since the size and scale cannot be properly conveyed in a photo. You can also pay a few euros to take the elevator up the center to the roof of the monument. After gawking at the Monument to the Discoveries for probably way too long, we wandered by the Torre de Belém (Belem Tower) and back across the street to the Museu Colecção Berardo, a great modern art museum that is also free! A short stroll away is also the Museu de Marinha (Maritime Museum). My husband loved this museum but I found that there were wayyy too many model ships for my taste. Note: Belem also happened to have some really great food, as noted in my previous post about this trip. 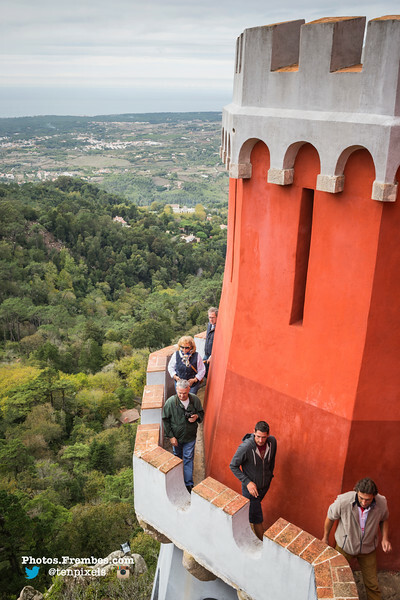 Last but not least, we spent our final day in Portugal on a day trip to Sintra, located northwest of Lisbon. It took a little over an hour on the train to get there, and tourists flock to Sintra by the trainload. We strolled into the old town rather than taking the 434 bus directly from the train station and stopped at the tourism office (Posto de Turismo) for a map. You can pick up the 434 bus in front of the tourism office that will bring you to the area tourist sites in one big loop. First stop, get off at Castelo dos Mouros (the Moorish Castle). If you aren’t castled-out yet, this is a great stop to see a perspective of the surrounding area. There are plenty of places to climb and walk around the outer walls of this castle that dates back to the 8th and 9th centuries. It is also a UNESCO World Heritage Site. Next stop is Palácio da Pena, a UNESCO World Heritage Site and one of the Seven Wonders of Portugal. Construction for this palace began in the Middle Ages where for centuries it was a monastery and a place for quiet reflection. The 1755 earthquake reduced it to ruins until the late 1800s when King Ferdinand purchased the site and transformed it into the summer home of the royal family. Today, Pena Palace is a popular tourist destination, but it also still serves as a venue for the President and other officials.